I did a research project on how to improve independent descriptive writing thought structured teaching of the writing process during Writer's Workshop. During this project. I designed mini-lessons and created writing organizers that enabled my students to use the writing process to write descriptive paragraphs. The lessons not only taught my students the writing process in a way that was fun and engaging, but they also learned how to think about and choose better topics so that they could successfully write descriptive paragraphs outside of the Writer's Workshop. Check out the video below that gives an overview of how I taught my students how to write a descriptive paragraph. See it in my TpT store here! Celebrate Read Across America Day with these hidden pictures in a 100's chart! Click here to download the Hidden Pictures . Check out my TpT store for more free Hidden Pictures! I used Daily 5 in my classroom the last two years that I taught kindergarten and I loved it! I purchased the Daily 5 book by Gail Boushey and Joan Moser and watched a video of the Daily 5 in action. It is literally the best balanced literacy program I have ever used. The first year I used it in my classroom I was a little worried that spending so much time teaching my students the "right way" to do the Daily 5 would take away from precious teaching time. Boy was I wrong! I spent the first six weeks of school (starting the second week) teaching my students exactly how to do each Daily 5. On day 1 we discussed why we do the Daily 5 we were learning that week. Next we discussed "independence while working" and filled out the "I" chart for that Daily 5. I then demonstrated the "right way" to do the it and talked my students through exactly what I was doing (I choose a book, I put the CD in, I open the book to the first page, I press play, etc). This then led to the discussion of what we "Can do" while working on that Daily 5 and we filled out the "I can" chart. The next day we role played the right way and the wrong way to do the Daily 5. (My students loved being picked to show us the "wrong" way to do it). After a student would role play we would discuss why it was right or wrong. We also discussed and wrote about what it is supposed to look and sound like while we are working on the Daily 5. For the rest of the week I had my students practice, practice, practice while "building their stamina." (For Listen to Reading I chose one student to pick a book, load the CD player and turn the pages while everyone else listened. For the other Daily 5's they were all able to participate each time we practiced). Each time a student did it the "wrong" way we would all stop what we were doing and go back to the carpet to discuss why we had to stop. The next week we would start it all over again with a new Daily 5.
and integrated three 20 minute blocks of Daily 5 time into my morning literacy time. Each day my students got to pick three Daily 5's to work on, and once they did one three times they were done with that Daily 5 for the week (except for Work with Teacher because we weren't doing that one yet!). I then spent the next three weeks making sure my students were implementing each Daily 5 correctly. We continued working on building our stamina for each Daily 5 while we practiced. I did not do guided reading with a single student the first nine weeks of school! I was still a little worried that my kiddos would fall behind because I hadn't started working on guided reading, but I soon realized that utilizing Daily 5 was probably the best choice I could have made. While I worked with students one-on-one and in small groups during Daily 5 time I did not get interrupted (or have to stop to redirect anyone) because they were independently working on their own Daily 5. Each student knew exactly what they were supposed to be doing and they were doing it! I was able to focus my attention solely on the student/s I was working with, and had the peace of mind that my other students were all working and learning on their own. If you're still skeptical about implementing the Daily 5 in your classroom I encourage you to read the book and watch some videos. You can find many videos on-line of teachers implementing the Daily 5 in their classroom. It really does work as long as you are committed to doing it consistently. 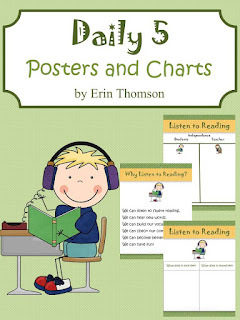 All of the posters and charts I used to implement the Daily 5 in my classroom are available for purchase in my TpT store. I live with my wonderful husband and dog son in Illinois. When I’m not creating lessons and activities I enjoy watching Blackhawks games and spending time outdoors with friends. I have an AAS in Child Development, a BA in Elementary Education, and a MS in Curriculum and Instruction. I’ve taught students between the ages of three and six in various classroom settings, including public schools, private schools, and Head Start programs, since 2001. I spent 9 years as a Pre-K teacher, and then moved into teaching kindergarten. I am currently working on my EdD in Early Childhood Education. I love helping the teachers at my school and making products for them to use in their classrooms. I have also made many products for my friends who are teachers! If you think there is something I can make for you, just ask! I can also expand on anything in my store, or tailor it to meet your needs and the needs of your students. Please visit my store and become a follower so you can see my newest products and freebies as they are posted!